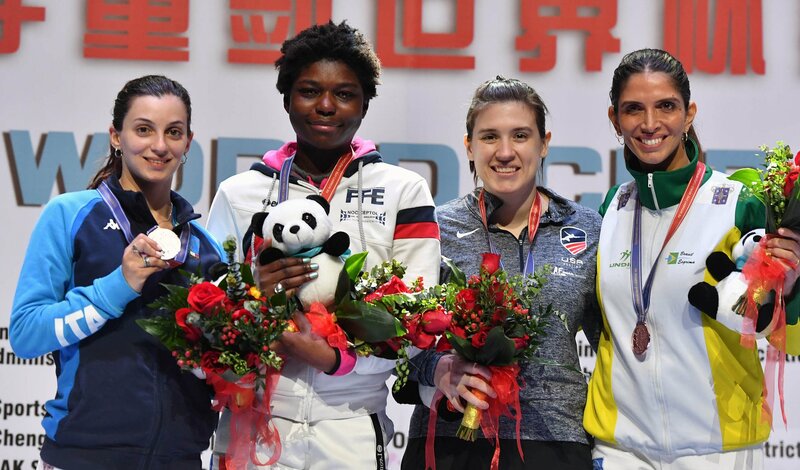 (Colorado Springs, Colo.) – Two-time Olympian Courtney Hurley (San Antonio, Texas) won her third individual international medal in the last year on Saturday when she secured bronze at the Chengdu Epee World Cup in China. A individual bronze medalist and team gold medalist at the 2018 Senior World Championships, Hurley earned a career-high No. 5 in the FIE World Rankings with her bronze medal finish in Chengdu. Exempt from pools, Hurley defeated Xinghui Li (CHN), 15-7, in the table of 64 and Anna Kun (HUN), 15-12, in the 32. Hurley advanced to the top eight after a 15-9 win over Nelli Differt (EST). Fencing 2018 Senior World Champion Mara Navarria (ITA) for the first time individually in her career, Hurley edged Navarria, 15-14, to guarantee a podium finish. In the semifinals, Hurley lost to Helene Ngom (FRA), 15-11, who went on to win her first World Cup title. Kelley Hurley (San Antonio, Texas), a three-time Olympian who won team gold with her sister in 2018, was exempt from pools, but lost her table of 64 bout to Aleksandra Zamachowska (POL), 15-10. Ranked No. 7 in the world, Kelley Hurley’s international results this season, including two top eight finishes, have secured her a position on her 12th straight Senior World Team with younger sister Courtney. Although the 2019 Senior World Team will be formally named at the conclusion of the USA Fencing Division I National Championships in April, all four positions were mathematically secured at the conclusion of the Chengdu World Cup. Rio Olympian and 2018 Senior World Team Champion Kat Holmes (Washington, D.C.) secured the third position on the 2019 Senior World Team. Holmes finished 4-2 in pools on Friday and bested Tamaki Terayama (JPN), 15-8, in the preliminary tale of 128 before a 12-11 loss to Nicole Foietta (ITA). The fourth position on Team USA also was in contention in Chengdu with former NCAA Champions Kasia Nixon (Los Angeles, Calif.) and Isis Washington (Parsippany, N.J.) both qualifying for the table of 64 with Nixon entering the World Cup as No. 4 in the USA Fencing National Team Point Standings and Washington ranked No. 5. Both athletes were looking to qualify for a first-time position on a Senior World Team. A junior at Princeton, Nixon also went 4-2 in the pools and defeated 2015 Pan American Championships medalist Leonora MacKinnon (CAN) and 2018 Youth Olympic Champion Kateryna Chorniy (UKR) by 15-10 margins to advance to the table of 64. On Saturday, Nixon lost her table of 64 bout against 2018 Senior World Team Champion Kristina Kuusk (EST), 15-8, but the top-64 finish gave the 2017 Junior World silver medalist the points she needed to qualify for the senior team. Washington needed a top-32 finish to pass Nixon in the rankings, but feel short of advancing after a 15-13 loss to Marie-Florence Candassamy (FRA). On Sunday, the Hurleys, Holmes and Nixon fenced in the team competition. The top-seeded Americans defeated Switzerland, 45-29, in the 16, but dropped the next match to 2018 Senior World Team Champion Estonia, 39-38. Although Team USA lost the next match to Poland, 45-37, the U.S. squad ended with a 45-36 win over France for seventh place to retain its No. 1 world ranking.